Shudder, O ye heavens! and, O earth, give ear unto these words: God descended once before for our sake; He descends again today for His Mother. O thou most Holy Virgin, who knew not wedlock, the heavens rejoice in thy glorious falling asleep, the hosts of angels are glad, and the whole earth crieth out in joy, singing to thee the funeral song, O Mother of the Lord of all, thou who hast delivered human kind from its ancestral condemnation. 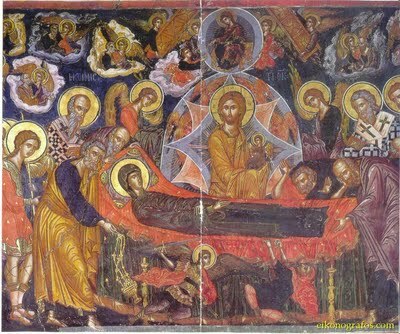 This entry was posted in 12 Great Feasts, Festivals, Liturgical Music, Miscellaneous and tagged 2017, Dormition of the Theotokos, Maronite Dormition Hymn, Troparion of the Dormition of the Mother of God. Bookmark the permalink.